After cracking a case of 2009 Topps and spending numerous hours sorting and organizing, we have an opinion about this set. Many of you were with us for the live blog on Wednesday and got to see many of the hits out of the case. Some were exciting -- mostly for Marie -- and others were just OK.
Base cards: The base cards have several variations of retired players. We received three: Ruth, Mathewson, and Mize. If you had opened as much as we did, you would know you could go blind trying to find these amongst all of the cards. Some base cards have white numbers and others have black. However, there are no black and white variations. It just had to do with the color matchups. The darker colored background had white numbers. The photos were better than previous seasons and the design was crisper. There wasn't too much going around the card to detract from the picture. There was a problem with cards having severely damaged corners, and bent. The group of cards that were unsellable were always located in the same spot in the packs, right behind the inserts which made us wonder how the inserts were all fine. We had to go through all the cards and make sure that the cards we used for sets, team sets, and eBay were all mint and if they weren't they were left out. 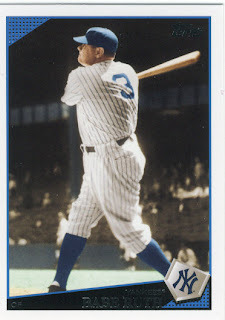 It's a little bothersome that some popular players were left out of Series 1 such as Derek Jeter and Russell Martin while other playes, who were free agents, received a 2009 card depicting their old team. This includes Mark Teixeira and CC Sabathia. Series 1 should include players that are shoe-ins to be with a certain team next season, or least as reasonably can be considered. Free agents should be left off the list and appear in Series 2 with their current team. Insert cards: There were several sub-sets within Series 1. There weren't many doubles of most of them. The sub-sets were: Black Parallels /58, Gold Parallels /2009, Turkey Red, Legends of The Game, Ring of Honor and Topps Town Gold and Silver. We were able to make complete sets of Turkey Red (50 cards), Ring of Honor (25 cards), Topps Town silver and two Legends of the Game from the jumbo case. the Ring of Honor were odd-numbered. We are assuming that the even numbers will be inserts in Series 2 to attempt to drive sales later in the year. We also did not get any variants of the Legends of the Game cards, i.e. gold lettering, or parallels. Ring of Honor is also a re-used name for a sub-set. In 2002, Topps used Ring of Honor as well as the 2008 Updates set. Hits: The 'hits' included Legends Commemorative Patch cards, Legends of the Game Relic Cards /20, Sketch cards 1/1, Game Used Relic cards, Autographs, and Jumbo Patch cards. We received six Legends Commemorative patch cards, and one Legends relic card. The Legends "nickname" patch cards looked cool and created to depict the area the athlete compered. However some of the nicknames missed the mark. Some players had several nicknames used in the set such as Mickey Mantle. 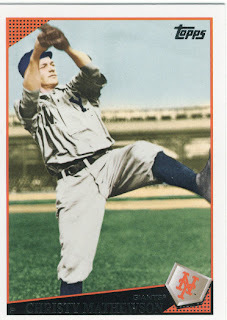 There are cards to create his ever-popular nickname 'The Mick.' However, he also has in the set, the widely-known 'Commerce Comet.' The second nickname doesn't have the same ring to it as The Mick and shouldn't have been made just for the same of making them. The Honus Wagner card would have made more sense in black/yellow than cream/red, but at least the nickname "The Flying Dutchman" made sense (Good luck completing the set). It was a great gesture for Topps to include these in the Series 1, but the fact that patches are not game-used and just fabrications, leaves something to be desired. In fact, we could probably get Topher to do something along the same lines and it would look great. We were more than pleased with the assortment of insert cards, although I was happier than Sooz because I ended up with a Pujols sketch card, Pujols game used jersey card, and a Pujols gold parallel. 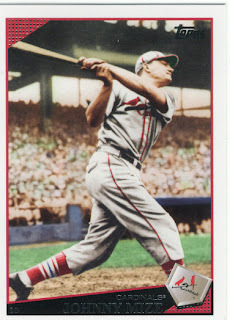 Many readers weren't fans of the red used on the game-used and autograph cards. The red was a bit too much and at times clashed with the photo on the front. What's missing: So simple and yet it just wasn't there. Topps did not provide a checklist for this set, which was rather annoying. This is a set that has many collectors. Generations of collectors get just this one set every year. Topps dropped the ball on that. Glad they had it: The autographs are going to be problems for pack searchers. While they still have the silver foil autos the cards are the same stock size as the base cards. Only the really good searchers with a special tool are going to be find these cards (not mentioning the tool for the sake of those who go out and purchase one). End game: For set collectors, everything is there: better photos, rookies cards, veterans and the occasional variants. Even team collectors are going to get enough cards out of the set to get their fill. However, this set isn't a player collector's friend. If Topps can build from this on the rest of the season, the company should put out a decent product this year. There is no room to go down from this. I thought the checklists were on the back of the classic combo cards (I only got one combo card, which had at least part of the checklist on its back). I think Topps did a terrific job with this set. I found very little bad to say about it in my evaluation. There are checklists on those, but for the set builder that's kid of annoying to not have the 3 or 4 separate checklists available to collate the set. Now a set builder has to first get those cards, then keep them out of the set to see who is what number. I would find that annoying if I built sets. as long as they put Adam LaRoche's picture, on Adam LaRoche's card... I'll be happy. Is that not the case with UD? I haven't seen any UD cards yet? In all fairness, I read everyone's blog on my blog roll. I read just about every post as well. However, anything that was posted since yesterday, I have not been able to read yet. Yesterday, I had to drive up to NY to pick up my car (took 2.5 hours, drop something off at a friend's and then drive all the way back to Atlantic City to cover a basketball game, which started at 8:30 p.m.
i walked into the gym at 8:28. then covered the game, wrote my article and headed to the office to get my paycheck. then went home and slept. today, i was covering two college basketball games. so i didn't get to ready any posts yet. i read all the great blogs. what?!? you mean you have a life other than this???? Blasphemy! Aside from leaving out some obvious stars, I think Topps hit a home run on this set. They finally rediced the border and made the card about the picture, a nice change. I bought two hobby boxes and ended up with two decent relics, a Prince Fielder jersey cards and Justin Morneau game used bat. I also pulled an Ian Kinsler silk card which was interesting. Not too sure what the story is behind this one. I also pulled two WBC redemption cards. Not realy sure what these are either but I'll put my code in online and hope it is a fun card I get in return. I was also really pleased with the Yankees rookies they put in the set. Francisco Cervelli, Humberto Sanchez, Phil Coke, and Juan Miranda were some I pulled. Did you guys find more or differnt Yankee rooks? Great review. I never even thought about a checklist until you mentioned it. Man, Topps dropped the ball with this one. I believe the even numbered Ring of Honor cards are the in store giveaways at Hobby shops this year. "Series 1 should include players that are shoe-ins to be with a certain team next season, or least as reasonably can be considered. Free agents should be left off the list and appear in Series 2 with their current team." Why doesn't anyone at Topps possess the common sense to think of this? Marie and I both enjoyed the set, even if the review was mediocre. I think for Topps it was a great start to the year. My hope is that it keeps going up from here. Dave, it really hit me while I sat there looking at the Sabathia and Teixeira cards. I kept thinking, everyone knew these guys were free agents. Why are they in this set when Jeter will die a Yankee. As for the Yankee rookies, these are all that are in the set: Cody Ransom, Juan Miranda, Francisco Cervelli, Humberto Sanchez and Phil Coke. I think you had all those but Ransom, Chris. In regards to the less-than-desirable fabricated patches... "In fact, we could probably get Topher to do something along the same lines and it would look great." OMG TEH FUNNEEZ! My word verification is FLABIO. WTF?! It was 100 percent compliment. The cards you make are awesome. I don't know what I think of those redemptions for the WBC. We have 6 of them I think, and we may just sell them. I haven't gotten around to listing them yet. What are your plans for all the damaged cards? Which really annoys the h*ll out of me. 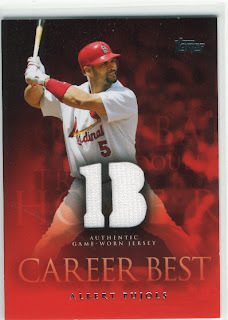 Topps has been notorious lately for its poor quality card stock. I haven't picked up any cards lately so I can't comment on this years stock. In the past, I have sent every out of the pack, damaged card back for replacement, Topps has been pretty good about that part at least. I'm one of the old timers (I'm 42) who didn't think Topps has made a decent base set in decades. I grew up with the funky cards from the 70's. (1975 has a special place in my heart). I didn't like much after the 70's. 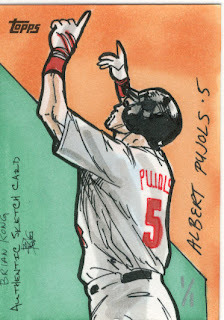 Having said all that, I really like this 2009 base set. Stunning photography. Many of the photos jump off the card. It's a clean, conservative design. The backs are nice. I think I'm going to buy the whole set this year (for the first time in about 20 years).